I think we’ve all been there before. 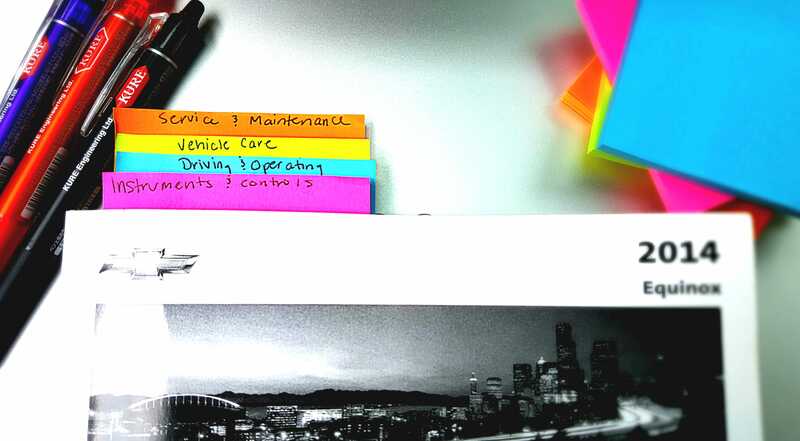 Something goes wrong with your vehicle, you reach for your owners manual and then call roadside assistance because you can’t figure out a single thing the owners manual is telling you..
And… we are also going to organize our owners manual to make it that much easier to navigate. It may sound strange but I think you will be thanking me later. Ok, first things first. Understanding your owners manual. How many of you have actually read your owners manual? I know it may not be the most glamorous novel out there but you should really take the time to read through an entire owners manual. I remember my Dad making me read my owners manual of my first car when I was 16 years old. I thought it was pointless, but once my first dashboard warning sign came on I was well prepared. In my pictures & demonstration, I used a 2014 Chevy Equinox owners manual. Every owners manual will be different depending on your vehicle, but for the most part, the layout will be the same. The first couple of pages in your owners manual will introduce you to your vehicle. Notice the symbols associated with your car. Notice how your care instructions are organized. Most important, flip to the instrument panel and go over what everything is in your car. After you glance through the beginning index, I want you to remember these four important sections- Instruments & Controls, Driving & Operating, Vehicle Care, and Service & Maintenance. These four sections will be the most useful. They explain everything you need to know about your vehicle from what kind of oil to use, to changing a tire, to checking your fuses. So be very familiar with this section! Remember when I talked about those four important sections in your index I wanted you to remember? 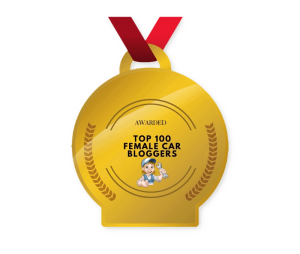 Well, we are going to highlight and mark them! Since you will be using those sections the most, highlighting them will make finding the page much easier. See doesn’t it already look organized? Now, we will go through each of those four sections and I will tell you what to highlight! The first section you need to understand is the instruments & controls section. 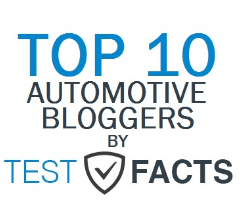 This is where you will find information on different controls ( where to find them and how to use them), dashboard warning lights (which you should already be an expert on if you’ve read my article called “Dashboard Warning Signs You Should Know“), and vehicle messages (like “engine oil low-add oil”). Read through this section and know what each sign or signal means. This will help you freak out less when your check engine light comes on! Highlighted Sections & Page Markers: Dashboard Warning Lights, Vehicle Messages. This section is all about learning to drive better. I think this section is overlooked because we all think we are the “best drivers”, but you can learn a lot from Driving & Operating. For example, they explain what you should do if you have loss of control (like skidding), how you should operate while driving in the rain or snow, hydroplaning, winter driving, and much more. It also explains what drive system your car has ( like all-wheel, front-wheel, or rear-wheel drive), ABS breaks, and traction control. You might think you know it all, but I guarantee you’d learn something from this section! The first thing you should be familiar with is under your hood. 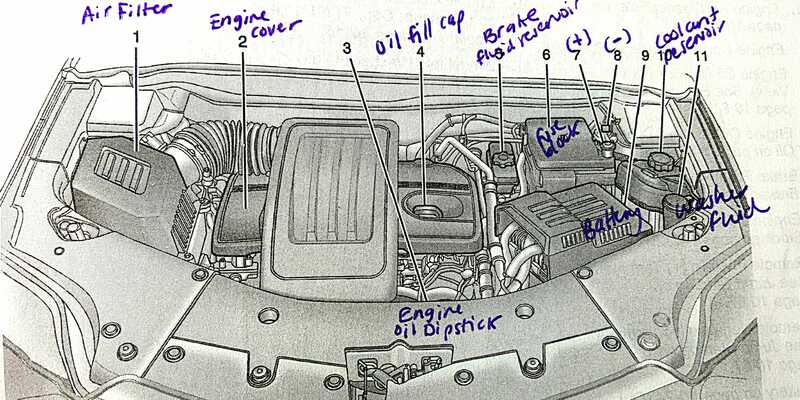 Take a look at the Engine Compartment Overview section and know what and where everything is. This will be beneficial when you want to jump your car, add brake fluid, washer fluid, etc. As shown below, take a colored pen and mark what everything is in the picture. That way you will know instantly what compartment you are looking at when you lift that hood up! Below are more highlighted areas you should have in your owners manual under the vehicle care section. In fact, I would add a tiny page marker to each section. 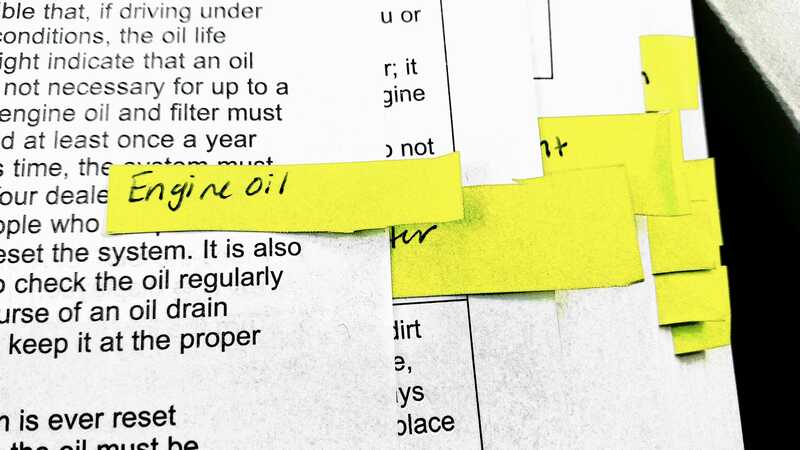 This section tells you what Engine Oil to use ( you might want to highlight that!) called “viscosity grade“. It will say something like SAE 10W-30, 20W-50, etc. I have that section dog-eared in my book since I look at it frequently. I would also read through the “when to change engine oil” section to know how long you can go between oil changes. The next important information you will learn from this section is how to check and change your air filter. The owners manual will walk you through how to check your air filter, what it should (and shouldn’t) look like, and how to replace it. Engine coolant information is included in this section; How to check and add coolant if needed. 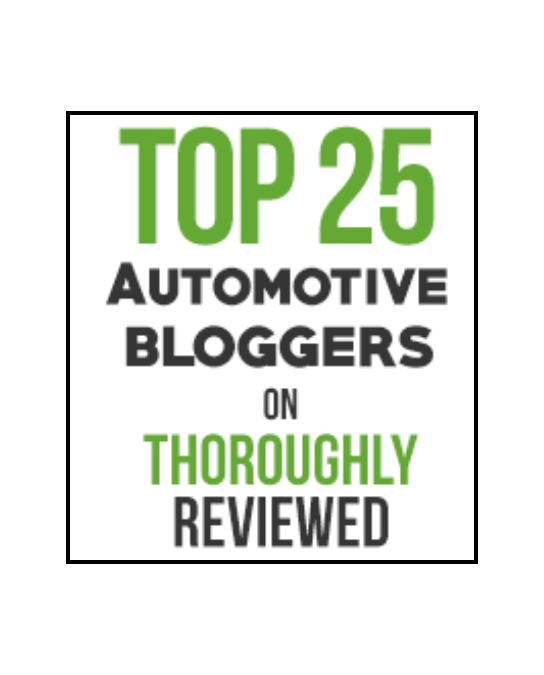 If you’ve read my series on “How To Make Your Car Last Longer” you will already know how important the engine coolant is. By now you should know where your washer fluid reservoir is. This section explains what kind of washer fluid to use and where to add it. Remember, try to use clear washer fluid, like this one from Invisible Glass. The tinted washer fluids have dyes that will clog your fluid pipes. I wrote an article about brake fluid you can refer to, to help you understand more about what it is and what DOT stands for. 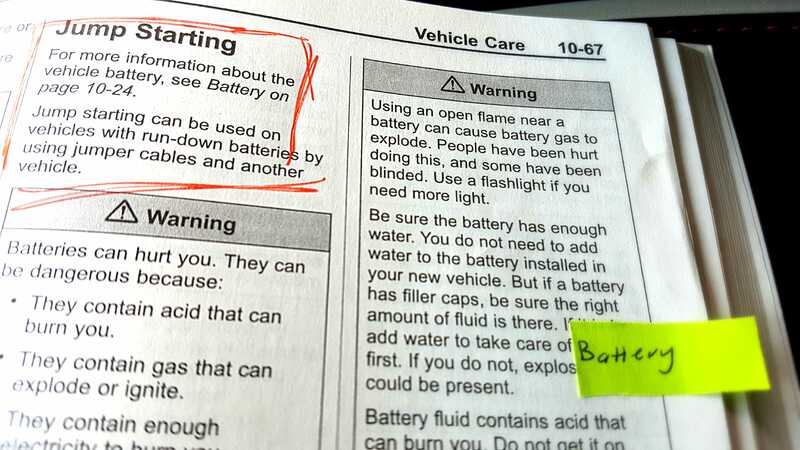 This section in your owners manual will explain where your brake fluid goes and what to add. If you have mushy brakes, you’ll want to check your brake fluid! Knowing where your fuse box is and what each fuse stands for is also important. You will refer to this section if you ever have a fuse pop, i.e. if your turn signal lights go out. This is a very long section in the book with everything you need to know about your wheels and tires. The difference between all-season, winter, and summer tires, labeling, tire size, PSI information, changing your tire, and much more. I would highlight Tire Pressure & PSI (you can learn more about tire pressure by clicking the link), Tire Rotation (when you should rotate your tires for even wear), Buying New Tires, and If A Tire Goes Flat (which will walk you through how to change your tire. Or you can watch my video!). This section will teach you how to jump start your battery! A very common thing that will happen to your vehicle. Knowing how to start your dead battery is important and very easy to do. In fact, just print out my instruction guide to help you jump your car in a jiffy. This section breaks down your maintenance schedule. I also have a maintenance schedule you can print out and fill in for each car. Keep it in your glove department and track your miles so you know when you should take you car in to be inspected and serviced! This section will tell you when you should rotate your tires, change your battery, change your belts, change your brakes and other fluids, wheel alignment, windshield care, and wiper blade replacement. Lastly, this section will give you the recommended fluids, lubricants, and parts to use on your vehicle. Sticking to a car maintenance schedule will definitely help enhance the life of your vehicle- plus it will save you time, money, and worry! How does everyone feel about their owners manual now?! You can glam it up as much as you want. Color code it (like I did), mark it up, and have fun. You should feel comfortable using your owners manual. It isn’t something to shy away from just because it can get confusing. 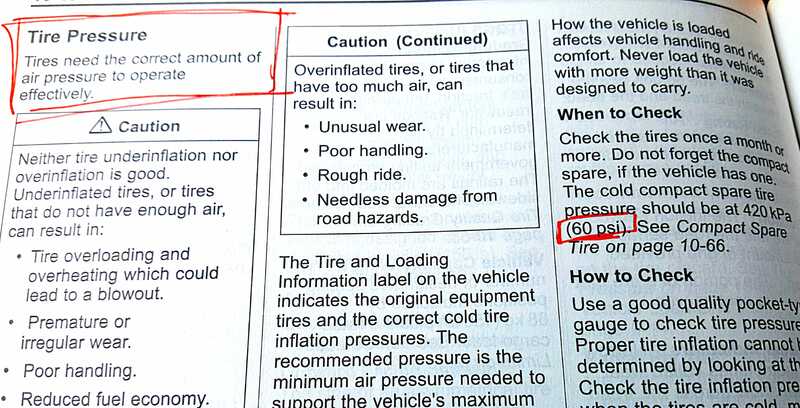 There is a lot of valuable information in all owners manuals, but there is also some pointless information they have to add in. Which is why we organize it! 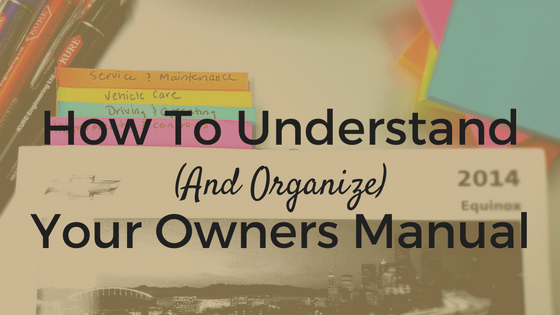 Organizing your owners manual will help you find what you need fast. And we love cars, which means we love fast! !